Impress family and dinner guests with a personalized flatware set. Each piece is permanently stamped with the letter of your choice. Traditional shape and bouquet design will coordinate with any table setting. Set consists of: 8 each dinner fork (2.5mm), dinner spoon (2.5mm), salad fork (2.2mm), teaspoon (2.2mm), dinner knife (80-85 gram); 1 each serving spoon (2.5mm), slotted serving spoon (2.5mm), gravy ladle (2.5mm), serving fork (2.5mm), butter knife (2.2mm), sugar spoon (2.2mm). Kitchen Goods, a unit of Dominant Systems Corporation, uses sophisticated crawler software to search the web looking for great product deals online. For this page, related items include products we find that match the following keywords: "Flatware" at our vendor partner Home Depot. 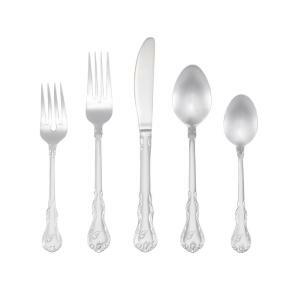 RiverRidge Home Bouquet Monogrammed Letter T 46-Piece Silver Stainless Steel Flatware Set is one of 106 Flatware and related products available for sale through Kitchengoods.com, If you have any questions on this product, please give us a call at 734-971-1210 during the hours of 9am - 5pm EST for assistance. Thank you for shopping at Kitchen Goods, your place for kitchen gadgets, and more!